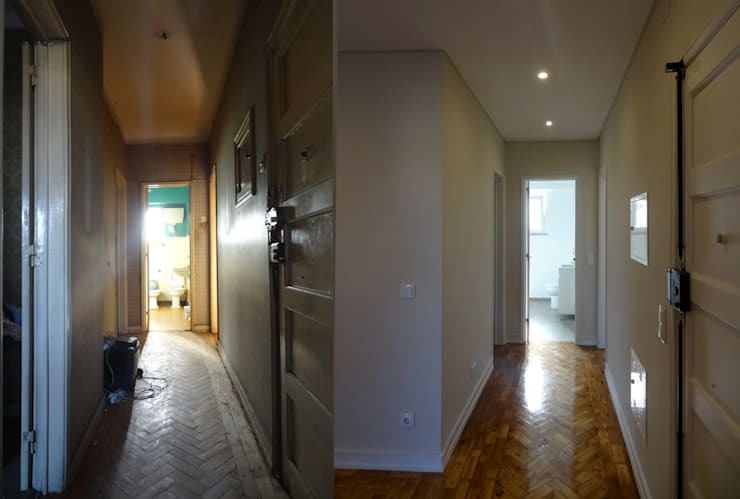 The entrance of the apartment leads directly to a corridor, which then opens up into different functional areas. Previously, it lay gloomy, with shoddy walls and a wooden floor lost somewhere under layers of dirt and grime. But now, fresh white paint has brightened up the passage’s environs, and the original herringbone floor has been fully recovered. Recessed lights on the ceiling add to the inviting aura as well. Creamy white walls and matching doors enhance the openness of the abode, while natural light streams in generously to fill the interiors with happiness. 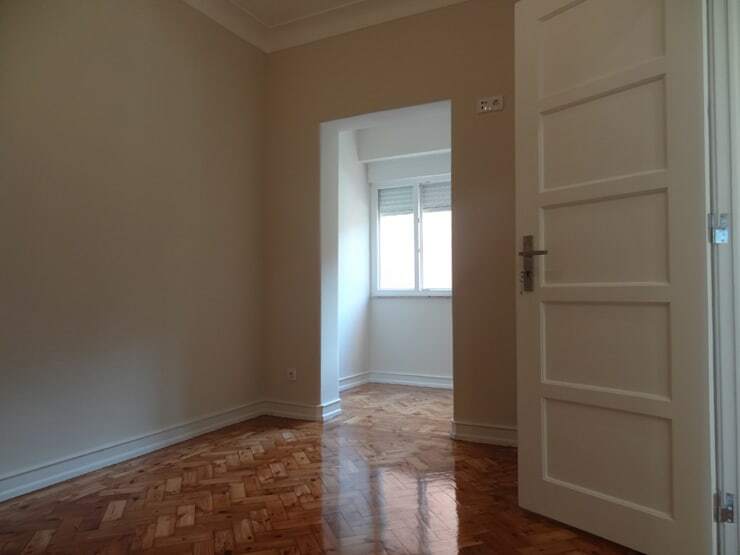 The gleaming wooden floors lend warmth and cosiness too. 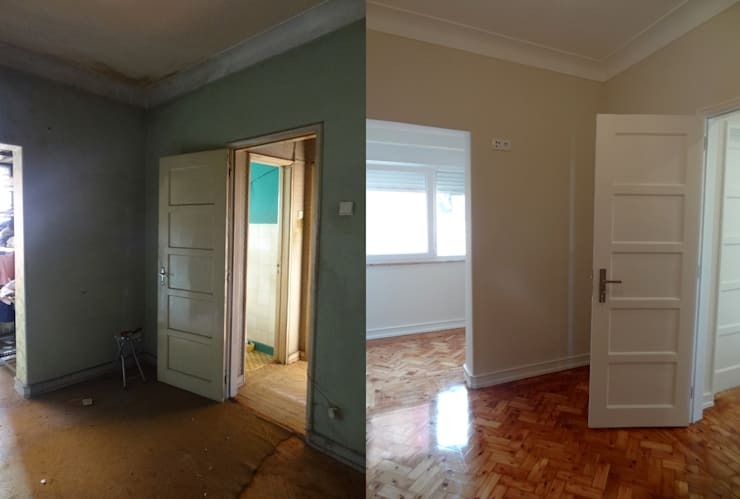 Faded blue paint and drab, neglected flooring made the apartment utterly unappealing before. Clutter also barred the adequate influx of sunlight. 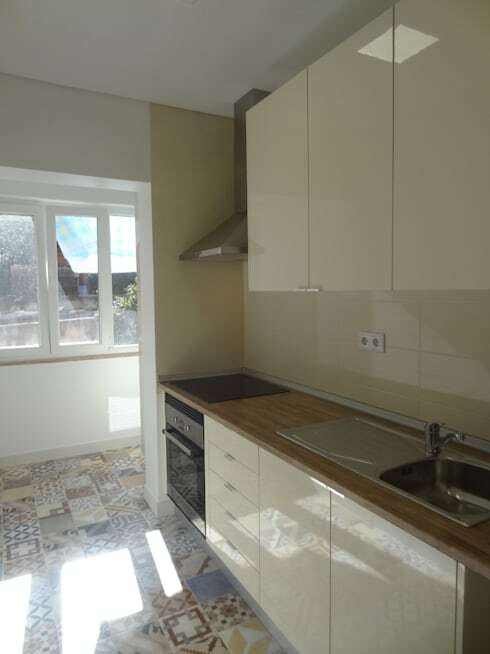 But now, the lavish use of creamy white hues and restored flooring make the interiors charming and optimistic. Without clutter, the large windows bring in oodles of sunlight too. The neat and bright renovated rooms enjoy ample space for arranging trendy furniture and moving around. 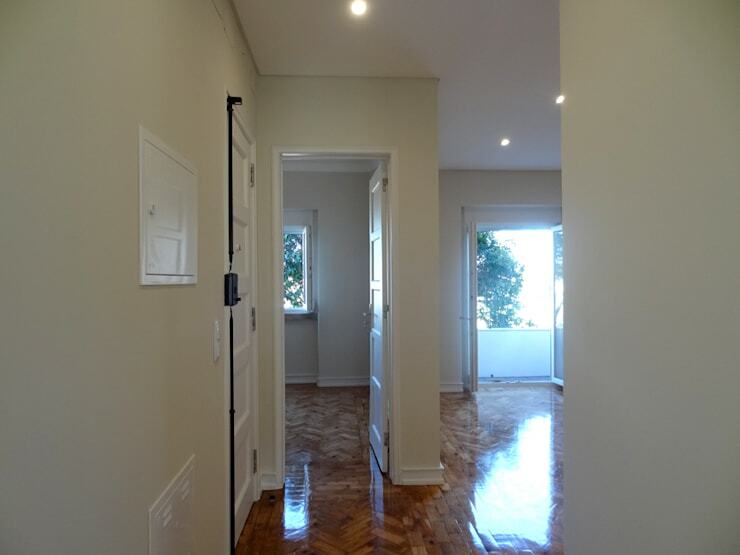 Sunny windows allow natural light to flood the rooms and reflect beautifully on the polished wooden floor as well. Originally, the kitchen was a nightmarish space with filthy shelves, chipping tiles, drab paint and cabinets falling off their hinges. It was in dire need of a complete and fashionable makeover, and that is exactly what the architects achieved! Modern appliances had to be brought in too. Gleaming and sleek white cabinets, a neat wooden countertop, stylish chrome appliances, and beautifully patterned tiles on the floor make the kitchen a style statement in itself. A neat array of windows brings in tons of sunlight and helps the space stay bright and positive throughout the day. 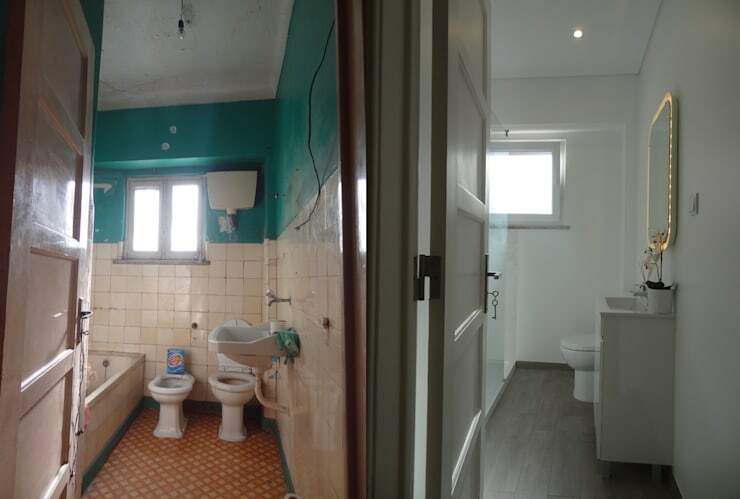 Jarring and bold turquoise walls, dated white tiles, a morose floor and unappealing fixtures made the bathroom uninviting and shabby previously. But look at the white and grey beauty now! What an incredible change, right? A new arrangement of fixtures, modern designs and a stylish shower enclosure have now perked up things. The window has been made larger and more continuous than before, and allows sunlight to flood the bathroom more freely. A mirror with a uniquely lit frame, a sleek sink and storage cabinet, contemporary fixtures and potted blooms make the bathroom a refreshing place in which to bathe. Inspired by this smart and trendy transformation? 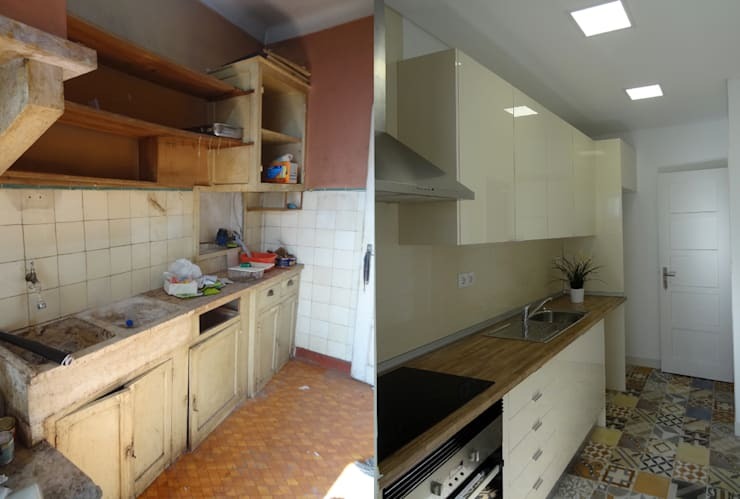 Check out another makeover story for more ideas: The impressive makeover of a disastrous home. 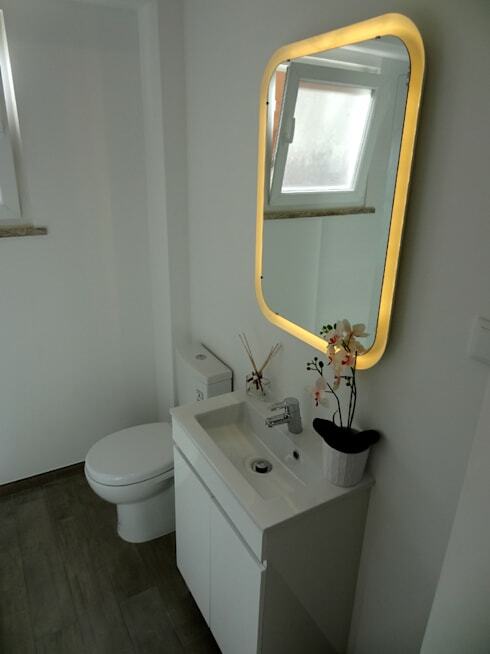 What do you think of the lovely new bathroom in this home?